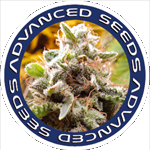 Advanced Seeds - Amnesia Auto. Free US delivery. Amnesia Auto is sativa dominant. Result of the union between Original Amnesia and Haze Autoflowering. Strong plant of medium height, easy to grow, fast growth and flowering, with large resinous buds. Good growth inside and outside, even in complex weather. It is characterized by its intense aroma and flavor, with hints of spices, lemon, etc. Its effects are powerful and long lasting at mental level, ideal for moments of calm. Powerful, long lasting at mental level, ideal for moments of calm.